With a stay at Kleopatra Bebek Hotel in Alanya, you'll be just steps from Kleopatra Beach and 4 minutes by foot from Alanya Aquapark. This hotel is 0.2 mi (0.3 km) from Damlatas Caves and 1.1 mi (1.7 km) from Alanya Harbor. Relax on the private beach or enjoy other recreational amenities such as an outdoor pool and a sauna. Additional amenities at this hotel include complimentary wireless Internet access, concierge services, and a hair salon. Located only 80 metres to the beachfront, this aparthotel is just 3.6 kilometres from the centre of Alanya and a short stroll from the public beach. Local amenities can be found closeby, while the harbour area, popular for its nightlife, is situated in the centre of the resort. Public transport network runs close to this charming establishment providing easy access to Alanya's Castle and Damlatas Cave. All the accommodation units come with a fully-equipped kitchen, living room and a private bathroom. Those guests travelling in their own vehicles will find a complimentary on-site parking. 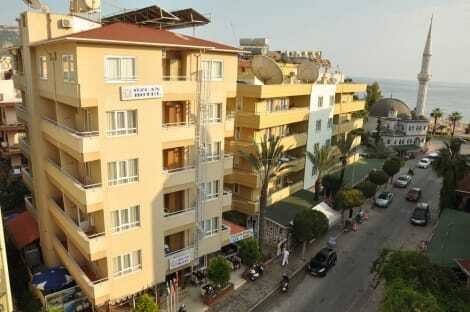 This apartment hotel is located in Alanya, 60 metres from the beach. A plethora of shops and entertainment venues are located about 200 metres from the complex. Public transport departs from stops located directly in front of the apartments. Local attractions include Alanya Castle, Alanya Dockyard and Arsenal, the Red Tower, Alanya Archaeological Museum and Damlatas Cave. A stay at Select Apart Hotel places you in the heart of Alanya, within a 10-minute drive of Kleopatra Beach and Alanya Aquapark. This family-friendly aparthotel is 1.5 mi (2.3 km) from Damlatas Caves and 1.5 mi (2.5 km) from Alanya Harbour. When you stay at Özcan Hotel in Alanya, you'll be on the Strip, just steps from Kleopatra Beach and 15 minutes by foot from Alanya Aquapark. This hotel is 1 mi (1.6 km) from Damlatas Caves and 1.5 mi (2.4 km) from Alanya Harbor. 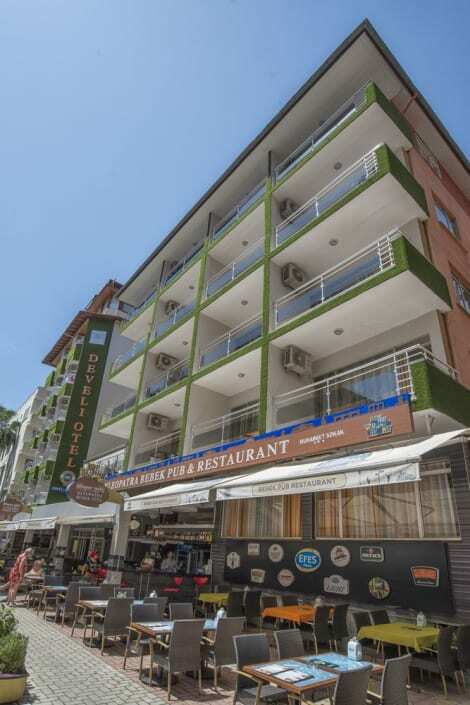 The tastefully furnished hotel is situated in a small quiet side street in the centre of Alanya. The sandy beach is just 250 m away, shops, restaurants and bars can be reached with a short stroll. Antalya International Airport is 130 km away. Features of the hotel include 34 studios and apartments, 24-hour reception, currency exchange, WIFI, bar, fitness centre, wellness, outdoor pool and bicycle rental. 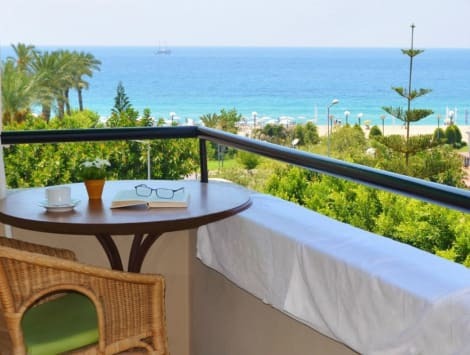 With a stay at Kleopatra Carina Hotel, you'll be centrally located in Alanya, steps from Kleopatra Beach and 5 minutes by foot from Alanya Aquapark. This family-friendly hotel is 0.3 mi (0.4 km) from Damlatas Caves and 1.1 mi (1.7 km) from Alanya Harbor. Featured amenities include a 24-hour front desk, multilingual staff, and laundry facilities. A roundtrip airport shuttle is provided for a surcharge during limited hours, and free self parking is available onsite. lastminute.com has a fantastic range of hotels in Alanya, with everything from cheap hotels to luxurious five star accommodation available. We like to live up to our last minute name so remember you can book any one of our excellent Alanya hotels up until midnight and stay the same night.